belgischer Comiczeichner (1907-1983). Tintins oplevelser. Det knuste øre. With orig. 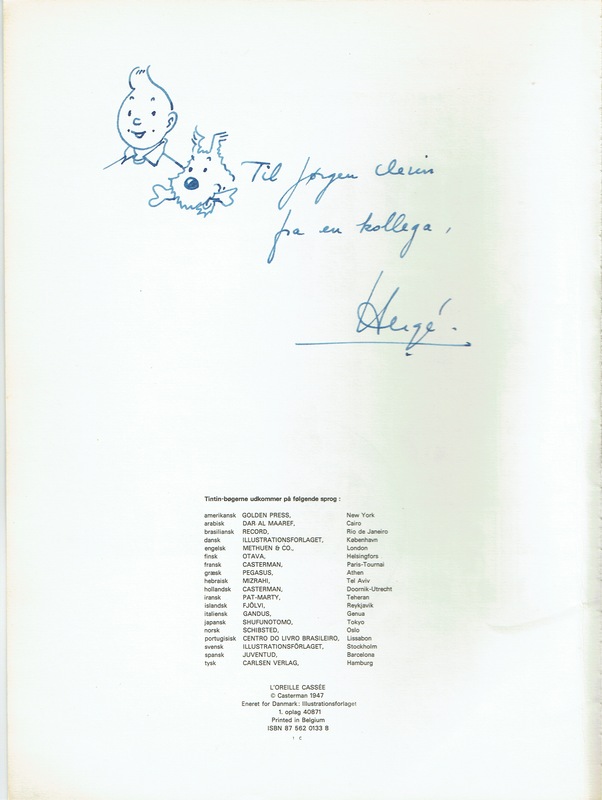 inscription and drawing of Tintin and Snowy by Hergé on verso of title leaf to Jørgen Clevin. Cph: Illustrationsforlaget . Orig. wrappers. With orig. 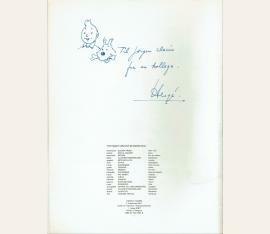 inscription and drawing of Tintin and Snowy by Hergé on verso of title leaf to Jørgen Clevin. The Danish cartoonist and author Jørgen Clevin was an institution in Danish children's culture for decades. Not least as a TV host, where he over the years made several hundred short TV programmes with hobby tips to the great delight of children and adults alike. In the early 1970s Clevin met the world famous Belgian cartoonist and Tintin's creator Hergé. On this occasion, Clevin received a personal greeting in the form of “Det knuste Øre” equipped with an original inscription and a drawing.